Hope you can help me with what should be a simple fix, but isn't for me. Is there a place where I can change the setting for this particular category group so that it totals to the bottom? Thanks in advance. As you may imagine, I've tried for hours and hours by myself to figure this out, without success. Building free modano models to help public health managers in developing countries understand the cost of prevention and treatment activities. 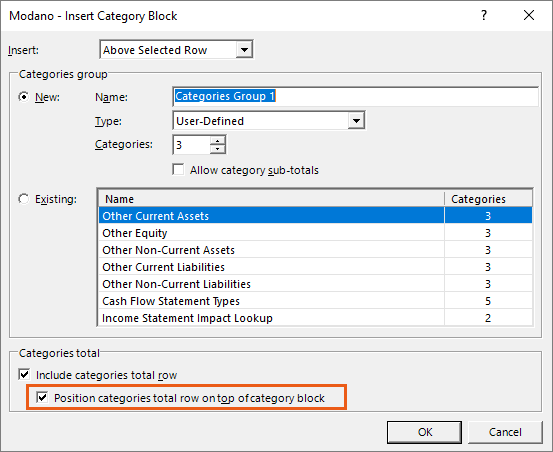 Modano does not currently support the moving of this total row from the bottom to the top of a category block, or vice versa, so if your existing category block contains a total row on the bottom you will need to add a new category block with its total on top and then delete the existing category block. When I do this I always insert the new category block before deleting the existing one, so that I can easily transfer the content within the existing category block rows into the new one, rather than re-creating it from scratch. You could also simply delete the current categories total row and use the row immediately about your categories as the total row, but this will not work if you want to use things like sub-totals within the category block, or link out category and total links out... So inserting a new category block is the best approach. Apologies for the time you wasted trying to figure this out, we'll add it as a potential future functionality. Thanks for helping me with this, Michael. I'll be replacing the category blocks. Good to know how this works both for now and in future.